Based on the popular cartoon Chuggington, Chuggington toys enhances your kids’ creativity as they learn how to assemble the train and put everything in its place. Children also learn valuable lessons in taking care of these train sets by learning where and how to store the trains, accessories, and tracks as well as the importance of keeping it safe until the next play time. To give you a detailed analysis of each Chuggington trains, we have decided to provide you with a long guide with Chuggington train set review. The excitement and entertainment that kids derive from play time is hard to describe in mere words! However, it is an important time for relaxation and learning and this makes it imperative that they have the correct play and learning toys and accessories to make sure they get the most out of playtime. Chuggington train sets give you a chance as the parent or caregiver to bond with your kids as you help them set up and play with their train set, and can help make your interactions very special. The kids are also able to relate to their beloved TV show while they recreate their favorite episodes of Chuggington. The Brewster’s Big Build Adventure Set’s design is based on the Chuggington “Ready to Build” episode. Chuggineer Brewster and Chuggineer Cormac are hard at work building a high speed tunnel and bridge from Chuggington to Tootington. The kids must help Brewster and Cormac travel up the escalator, operate the crane, and repair the broken bridge, an exciting challenge for the kids as they try to get this done. This set is made up of various components that include an elevator, escalator, working crane, trick bridge, tunnel, and two die-cast engines. There are also four levels of elevation and multiple layouts for extended play time. 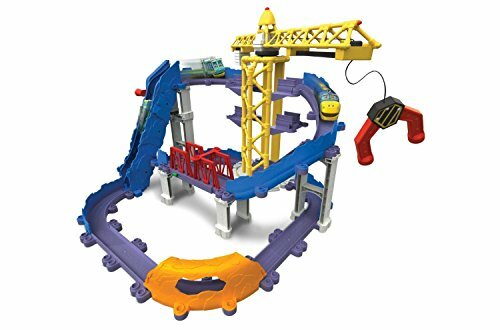 The Chuggington Stack Track Brewsters’ Big Build Adventure Set is available at Amazon.com and includes free shipping. Younger children need help with assembling and making changes to the track layout. Overall this is a solid train set and offers a good value for your money based on its quality and pricing. This set is recommended for children age three and older, and, for best results, requires an adult or an older child’s help in designing and assembling the set. For an added bonus, we want to show you a short video that covers unboxing of this lovely Chuggington train set up to assembly. Stack tracks are known to consume a small amount of space as the tracks go up instead of expanding sideways. The Roundhouse Wooden Train Set is comprised of 32 pieces and features a one-level roundhouse with an over-the-top track layout. The set includes engines Koko and Brewster, announcer Vee, a Chuggington sign, and a 2-in-1 tunnel. The 2-in-1 design creates more options for play. 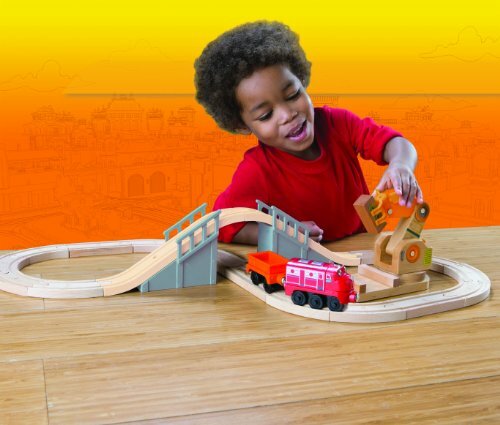 This train set comes loaded with easy-to-connect magnets that are used to simply connect the train pieces together. Set up is easy, making it possible to get ready for play in a short time. 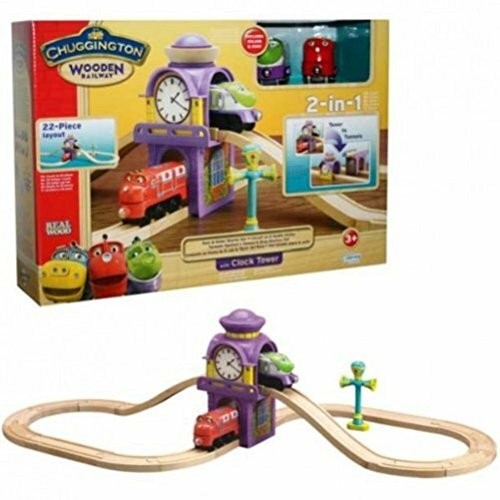 The Chuggington Wooden Railway is also compatible with other wooden toy train track systems making it fit in nicely with your child’s other sets. The Chuggington 32-piece Roundhouse Wooden Train Set is available at Amazon.com and includes free shipping. This set makes for a good purchase with its quality construction and variety of parts that enable you and your child to enjoy different play scenes that you can set up to your hearts’ desires. This Chuggington Wooden Railway All Around Chuggington Set is designed to be fun and educational. It has an engaging and challenging manner. Wilson, Koko, and Brewster need your child’s help to find their way from the Double Decker Roundhouse to the Clock Tower, to Old Town, and through the Signal Gate to pick up cargo at the crane and make their deliveries on time. There are a variety of activities that you and your kids can engage in with this set. The Wood Railway allows you and your child to design the layout of the tracks any way your imaginations lead you. This set is designed for children age three and older. 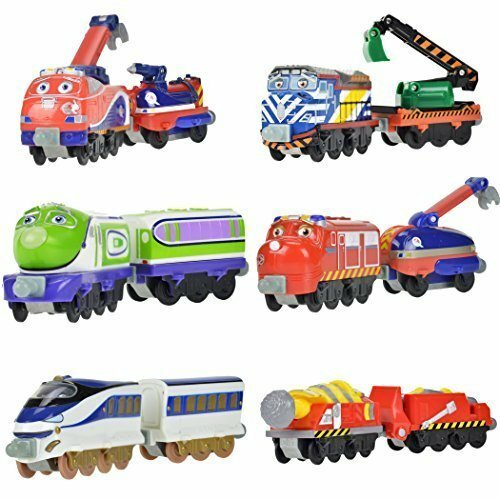 The Chuggington Wooden Railway All Round Chuggington Set is available at Amazon.com and includes free shipping. The wooden pieces make this train set durable. Multiple pieces and parts can be used to design different activity scenes during play time. This set is fully compatible with Thomas the Tank Engine sets. This train set has numerous parts but still manages to be easy to set up. The price might seem a bit on the higher side but it is worth its selling price. There are types of Chuggington train toy sets that use a combination of wooden and plastic tracks. The best way to determine the integration would be through this set. This Load Figure train set from Chuggington, will satisfy your kid’s love of trains. The crane pertains to the loading figure which adds more inter-activeness in the set. You would be surprise of what it has to offer you. For an easy-on-the-pocket price, the set includes 21 fantastic pieces of train parts and the accessories you need. The tracks forms a simple 8 figure, being connected by a plastic bridge cross track. The train cars feature a fun and loving character in the long series of Chuggington trains, Wilson. The set is strongly made from wood and some parts from durable and hard plastic. It follows a standard sizing of its wooden toy train tracks and standard couplings. 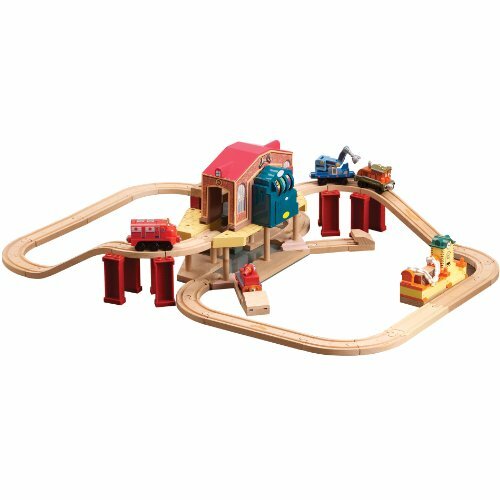 This means that the set’s versatility allows it to easily fit with other wooden railway brands. The design, having a crane, creates an imaginative or creative play. It will bring your kids to imagine themselves in an actual loading station. Materials used to create and crafted all pieces of the train set came from non-toxic materials and from real wood. The set is simply safe for kids. The set seems slightly expensive as you only get to have Wilson, a cargo car and a crane. It has a small layout and includes limited tracks. You will have to purchase an expansion train track set to change the track layout. Although the set comes small, train track expansion set is not that expensive. You can have loads of train cars and tracks to add to your collection by paying only a certain and affordable amount. Going to a much cheaper Chuggington set, this value pack train toy set comes in 20 pieces, complete with tracks and a single piece of train car, entirely for a very low cost. This would be a viable starter set for your kids. It instantiates their train experience and starts developing their skills and intellect. The set is recommended for children aging 3 years old and higher due to choke-hazard materials. It includes a train car made from die-cast materials which makes it strong and durable. The train car has a light and sound feature to make as an added bonus to fun. The set however, despite being a good starter train set, would have a hard time being compatible with other train sets from major brands. It is however, compatible with Chuggington Stacktrack train set. It would not bore your kids easily due to the movement, light and sound features the train offers which is not generally available for most wooden train sets. The tracks can be used to stack up like with stacktrack series of Chuggington trains and be able to connect with it. The same goes with the train car. It is highly intellectual and educational. The set may require some assembly but it will help your kids develop their set of skills. The versatility of the set is low. It would have a hard time fitting with other brands, making it difficult for you to expand. Although it has bright lights and musical sound features, it only comes with a single piece of train car. This is would be a great investment for your kids. It may be cheap but the quality and the benefits they’ll get are beyond what you have or will pay for. The next Chuggington wooden railway set is created with great craftsmanship. It features a rescue station in which there are lights and sounds. The set includes 2 of Chuggington train’s favorite character, Wilson and Calley. Both of which are rescue trains in the original animated series. The light and sound can be played through Calley’s computer. It allows the set to be more realistic. Each of the pieces included in the set is made from a combination of non-toxic durable plastic and from solid wood. It highly fits with other wooden train tracks and toys. It has a stacking design that creates an elevation to which the train cars passes through, a rescue station. The set is fairly large and will look perfectly on top of a sturdy wooden table. Surprisingly large, the set can still be expanded if you prefer it to be. You just have to buy an expansion track set for a reasonable amount. You can also choose to add more train cars if needed, thanks to its great compatibility. It will give additional fun to the set and will avoid any boredom. The tracks, station, and other accessories is designed with highly comprehensive colors and details. It is very expensive for just a wooden train toy. The set is a good starter and amateur train lover set but the price will tell you otherwise. Yes, it may seem a little bit expensive but it comes with features, not available to an ordinary wooden train toy set. If budget is not of any issue, this toy is greatly recommended as it will provide your kids at home with the right amount of learning and entertainment. Chuggington has two types of kid’s train set, a wooden train and track set and a stacktrack set. Stacktrack set is a collection of train cars and tracks, made from die-casted materials. It is a combination of hard plastic, durable rubber and strong metal. This set is what they call a 6-pack. It includes 6 pairs of train toy cars, all of which are characters in the actual animated train series. There are only a few of this bundle pack left in the market, the same goes with buying them individually. This would be your chance to extend the number of train cars in your existing stack track set or this would be a great starter train cars if you plan on buying a separate stacktrack train tracks. The toy is a collectible. This pack will save you the trouble of looking for each individual train characters. The bundle will save you some amount of money instead of buying them individually. It is connectible with other stacktrack train cars, making connectivity fast, smart and easy as you expand. The set is a collection of train cars. It does not have any tracks included. This will require you to make some effort in looking for an appropriate train track for your collection. The price is a little bit overwhelming for some train car lovers or enthusiast. In conclusion, this amazing Chuggington train car set will fill up your tracks with high quality and detailed design toys. You or your kids can expand the train cars in your existing set with only one purchase. With all these talks about stacktrack train tracks, here is a walkthrough of the product. 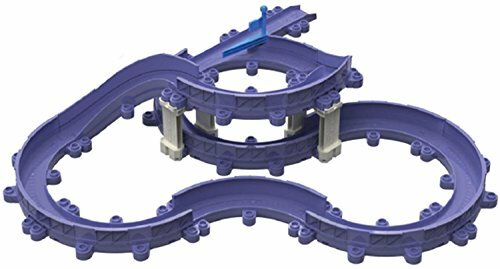 This is a Twist and Turn track pack from Chuggington. It features a train tracks that are made from high quality, die-cast components such as rubber, plastic and metal. The concept of this track is to allow the user to expand, UPWARDS, by stacking each track instead of expanding it sideways. The fun your child will get by watching the train as it whirls down from the top is something they wouldn’t experience from other types of train sets. In addition, you do not need a motorized train car to make the train car move. Gravity will do the magic of moving your train cars from top to bottom. This stacktrack train track pack includes 15 pieces of durable die-casted tracks. It enables the user to have an upward and higher train track layout. Compatible with all Chuggington Stacktrack set. This set greatly stimulates the mind, improving a child’s set of skills and intellect. As you expand upward, it will be harder and harder for a child to play with it, hence, making your expansion limited. A wooden train set is much stronger to break compared to a stack track set. It is surely known by many that a wooden train toy or set has greater durability compared to a die-cast train set. However, the stacktrack train set is an innovative product which focuses on giving your child the proper developmental nourishment. One way to build up your children’s skill and intelligence is through this Interactive, All-Around, Chuggington train set. This features Chuggington train character toy, Wilson. The train set’s design, structure and details are top notched and beyond ordinary or mediocre price train toy set. It is complete with a battery operated train toy, sound and light features. The train track layout of the set includes a station, a crane at one end and an elevated loop to where Wilson can circle around. This is best for kids with age ranging from 2 to 6 years old. It is a toy, guaranteed to never bore your children. It is a complete set. You do not need to worry about conducting separate purchases. The whole set is a ready-to-run train set. The sound, light and motorized train feature will add more life to the set. It increases the children’s play-time without getting bored. The train set is larger than the usual wooden or stacktrack train set. It does not fit all Chuggington train products or other train sets from major brands. The set requires a lot of batteries which is sadly, not yet included in the total price of the set. This is a set to look for if you have no idea what train toy set your kids would want. It is fully packed with features that are not available in ordinary wooden set. Every single push of a button turns on a light and sound features that brings new interactive play and story. This is a very nice set that promotes a healthy, imaginative and creative play. The next Chuggington wooden railway set features Koko, Hodge and a 2-in-1, Clock Tower. The tower clock, as seen in the picture, also serves as a tunnel wherein Koko and Wilson pass through. 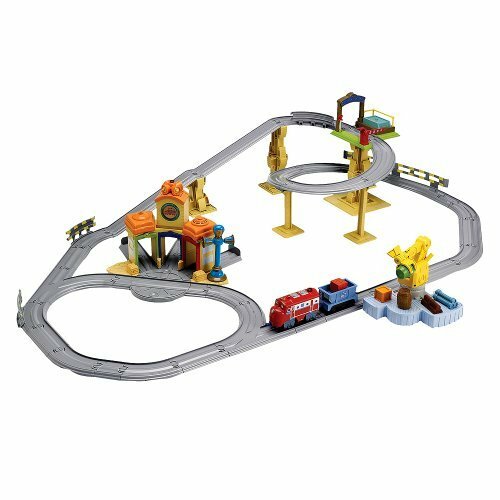 The set includes a track which forms a simple figure-8 train track layout. Most pieces is of real wooden construction. This set uses standard train wooden tracks and each train car uses standard magnetic couplings. It is to make the set more versatile and able it to connect with other wooden railway toy brands. The cross bridge has a clock design with nice details. You will seldom see cross bridge that has a tunnel on top. It comes with only a few pieces of train cars and tracks, but thanks to its high compatibility, expansion is easy. 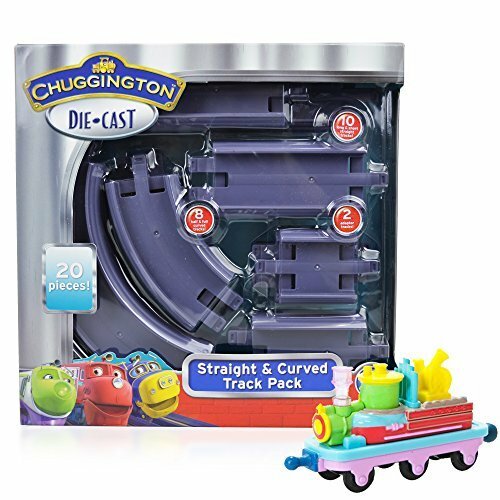 This is an official Chuggington train set product. Made from real, durable and solid wood. The set is small and comes with only 2 train cars, namely Koko and Wilson. For the price, you opt to get more pieces of train parts and accessories. This set is a little bit expensive compared to most brands of wooden railways. It also has a smaller size to be precise. 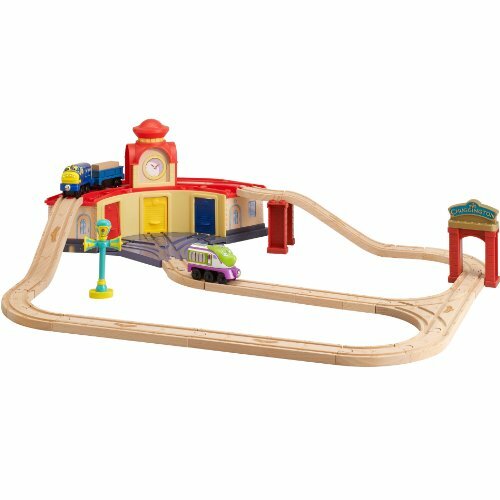 But this is an original set from Chuggington wherein most wooden railway set is only inspired by Chuggington but made by other companies. The set inspires hours of fun and imaginative play. The video below will show you the actuality of the train, from unboxing up to the play. It is actually quite simple to assemble and connect. It does not require expert skill or tremendous amount of effort as you try to fit each track. Some products in our previous sets talks about cranes, how about scaling it up a little bit? This set features 2 beloved Chuggington characters, Wilson and Chugineer Zack as they circle around a wooden railway with a mega crane at one end. The crane has the capacity to lift up and load down a train car. It also provides added interaction as your kids tries to play imaginatively. The train, mega crane set comes with parts and accessories that form an elevated, 8-figure train track. It includes 2 train toy cars, inspired from the characters of the actual Chuggington train animated series. Each piece is comprehensively detailed and crafted from durable, thick and safe materials. The set fits any wooden railway toy set from popular brands. It comes only with a character train engine car. It has no add-on cars like a passenger car, coach car and other types of car. The price is neither that expensive nor cheap. Features such as sound and light would be great. 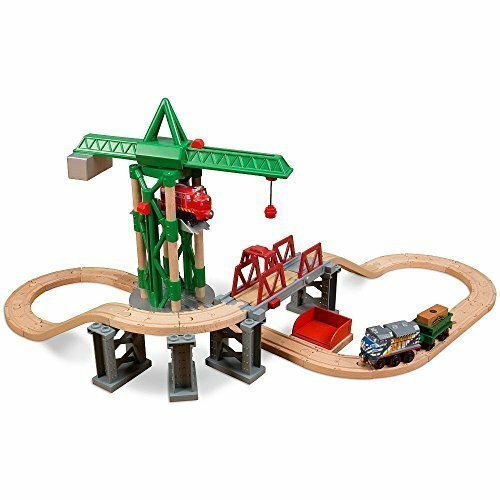 This amazing mega crane, train set from Chuggington is one of the wooden trains set monstrosity you can buy for a low and very reasonable amount. It is great as a beginner set or an added set for an existing train wooden set. When it comes to choosing your Chuggington train set, your decision should be pretty easy. The Chuggington Wooden Railway All-Around Chuggington Set comes out as the best train set. However, we live in times where budgets play a crucial role in all our decisions and hence its relatively higher price might not fit your budget. In that case, The Chuggington StackTrack Brewster’s Big Build Adventure Set is a good buy as it combines quality and value but at a much lower price. If you are looking for a less expensive option than the Wooden Railway All-Around Chuggington Set that your child can easily assemble without your assistance, the Chuggington 32-piece Roundhouse Wooden Train Set with Koko and Brewster Engines is the way to go.